This is a sponsored post by Lucky Leaf but all opinions are 100% mine! Are you getting your meal plans together for Thanksgiving? How about adding a non-traditional pie to your list! 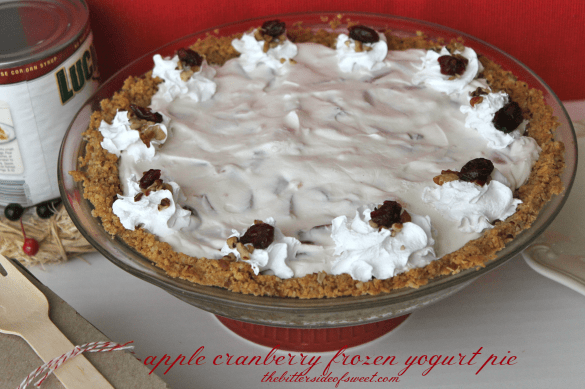 Apple Cranberry Frozen Yogurt Pie with a graham cracker pecan crust! This adds all of those tradition flavors into one dessert! Every year for Thanksgiving I always try to add something nontraditional to our menu. Why do I do this? So I can experiment with other recipes and flavors that I probably would not normally go out and use or eat. This year, when I received some pie fillings from Lucky Leaf I decided to change up a frozen yogurt pie I make. Now GUESS WHAT! 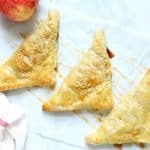 Lucky Leaf is having a contest and they want your best recipes using their pie fillings! 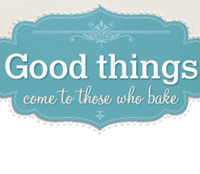 And you know what, they are going to help you by allowing me to giveaway some pie filling to help you get started! Make sure you enter to win! ENJOY! Traditions fall flavors of apple and cranberry pie filling made into a non-traditional pie! Preheat oven to 350 F. Spray 9 inch pie pan with cooking spray. In a small pot melt the butter. Set aside. n a food processor or in a plastic baggie crush the graham crackers. In a bowl add crumbs pecans and sugars. Pour in butter and mix with a fork. Press into the bottom and sides of pie pan. Bake for 10 minutes. Allow to completely cool. Meanwhile, in a large bowl combine the Greek yogurt, pie filling and whipped topping. Using a whisk, combine the two until incorporated and there are no lumps. Take the pie out 30 minutes before you are ready to cut and serve. ENJOY! Don’t forget The Lucky 13 Recipe Contest started on November 6th. Enter your best original recipe using Lucky Leaf® Pie Filling for a chance to win one of 13 great prizes, including the $2,500 grand prize! Please submit your recipe between November 6th and December 2nd. Qualified recipes will be on display in the recipe gallery on the Lucky Leaf Facebook page starting on December 3rd. Make sure you also use #Lucky13 to show off your work on social media!! I love to use pie filling in pie pops and also in homemade ice cream. That’s sounds great! Thanks Heather! This crust does look outstanding! What a pretty pie too! I’m thinking of just posting the crust it is that good!! Thanks Tahny! I love making no bake pies or “pie” dips!! I like to use it on cheesecake pie. I love it on my cheesecake and sometimes on my oatmeal! Oh wow that pie looks good! If only we celebrated Thanksgiving in the UK! I love using it in tarts! YUM. 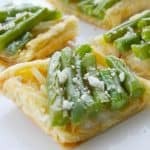 What a fun pie recipe! 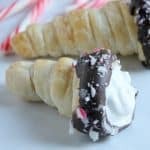 Perfect to make in advance and keep on hand for the holidays! Pie filling is so yummy with cheesecake (or layered as a parfait). Love the frozen yogurt idea! Thanks Erin! I actually added it to yogurt and ate is as a snack! Im boring – I just like to use them in pies. Lol. Lol! Thanks funny! I ventured out and used them in cookies once! Oh boy, I wish I had a piece of this right now! This would be perfect for the holidays!! I like to use cherry pie filling on top of plain cheesecake! I’m sad I missed the giveaway but this looks delicious, anything frozen sounds good right now! Thanks for sharing on the weekend re-Treat link party! I LOVE frozen yogurt/ice cream pies! IF you ask them they totally beat regular cake but that is a ice cream lover speaking 🙂 And with the fruit additions? Total winner! 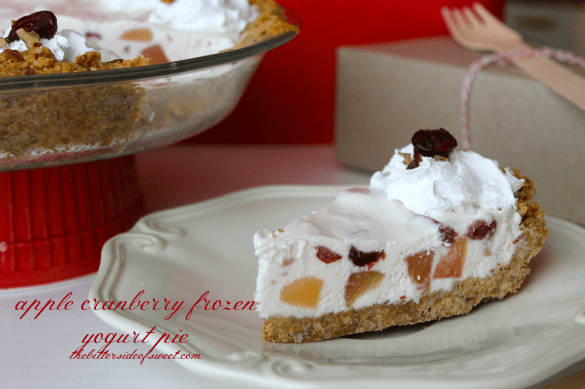 I love a good frozen pie and the fruit combo on this one sounds divine! 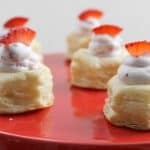 This is such a gorgeous and delicious recipe! I would love to make it for Thanksgiving! Pinning! This is totally unique and awesome! 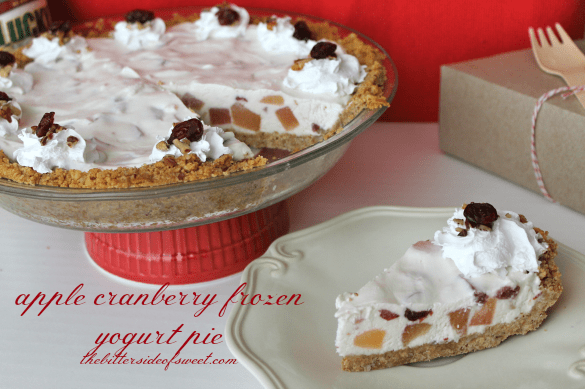 I’ve never heard of a frozen yogurt pie, but I’m glad I have now! I’m going to have to make that pie. Especially with that good looking crust. My husband would be ever beholding to you. 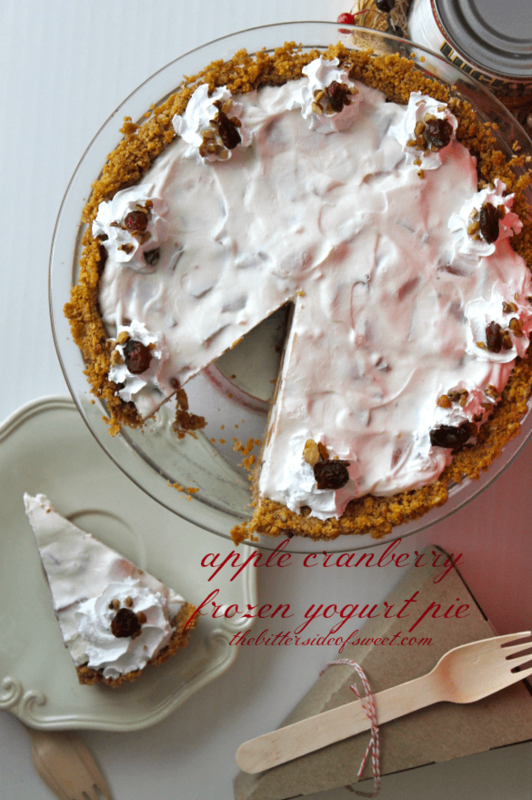 Gorgeous photos and amazing looking apple cranberry frozen yogurt pie! I think I’ll try your recipe next week! Thanks a lot for sharing!